your phone selects the right carrier. I believe the roaming partner in the usa for lyca is t-mobile usa. If your on other carriers i might charge you roaming rates or just not work. So if your in USA and can't get a signal don't worry its just poor T-mobile coverage not your sim card. I used their sim card last year lycamobile.us in usa it was ok service for the price. Your swiss lyca well PLEASE let us know the results of your roaming. I am sure all of us are curious to know the results. togglemobile.co.uk has been offering free roaming in EU+CH+US+Australia (and some others) for quite some time now. You can use up to nine numbers simultaneously (for example Swiss and US), incoming is free, outgoing 3p/minute. 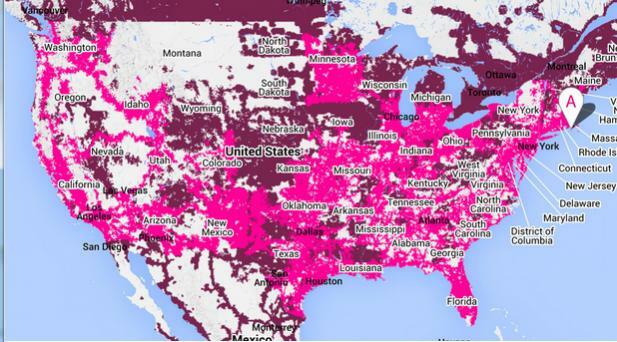 In the US they (also) use the T-Mobile network. Oh - I think Togglemobile is a Lycamobile brand. west coast cities.. Anyway the only issue I have with toggle mobile is their stupid topup system that hates foreign credit cards. In the end I just spent the money on the card and gave up..
if you can overcome the stupid top up issues (the single point of failure for me) if you don't have a uk credit card then your good to go. their customer service was more then useless when asked why their system kept refusing any of my no uk credit cards... good luck.. Customer Service: I agree, practically non-existant. Top-up: I use a UK credit card, but I know of top-ups using German and Swiss cards. I will report on how the coverage was....If I allow roaming on my iphone and I am not within tmobile coverage, I wonder if I will be moved to ATT/Verizon and be charged roaming fees? I will look into that. Togglemobile is very intersting, especially the 9 numbers. Their data seems to be a little expensive though. Do they give a bonus when you top up? ...Their data seems to be a little expensive though. Do they give a bonus when you top up? No bonus and I agree I find their data-rates expensive. Within EU+CH there´s a German SIM >>base<<, in other countries it´s still better to get local cards and do the >>netvoip<< divert. Going to Russia for a few days soon. Local Russian SIM card is ~CHF 10 incl. one GB, so that´s data covered. AldiMobile divert to Swiss-fixed lines by deducting from 1000 monthly minutes, i.e. it doesn´t cost anything extra. Result: If someone calls my Swiss number(fixed or mobile) I receive the call in Russia, costing 10rp/minute. Data is covered. No roaming charges when you use your Lycamobile abroad in 17 destinations. You need to have a qualifying bundle (e.g. EU19). Phone and SMS only. Data roaming requires a separate (paid) add-on. Does anyone know where the details of this paid add-on are? Does this mean that if I take my Lycamobile CH SIM to Italy, and roam on Hutchison 3 (which is the Lycamobile IT host network), then I can buy and use one of the data-packages advertised on Lycamobile IT? Most of yesterday and now today again my phone is searching for network every few minutes.. When it finds it it gets 3g, not LTE then no signal again a few minutes. Didn't notice much because i was on wi-fi most of the day but still crap. Yep, same thing here. Weirdly enough it works indoors (like in my apartment) but not outside. A colleague called them yesterday and they had no idea - they were going through the usual routine, i.e. "try it in another phone", etc. I have the same problem. Yesterday when I turned off the phone and restarted it fixed the problem....today it doesnt. I had also noticed that the voice quality was of really bad quality in the days (week?) before this outage. Some calls would not go out, some calls would connect but without ringing. Half Rate Codec (bad voice quality). The band switching was overcrowded local mast + lack of backup in the area. I normally had zero problems with signal or calls on LYCA. for SWISSCOM to get of their bums and fix it..
its just annoying to have to read read read, decide which is best. Lycamobile can be my backup for when I travel, or for 10gb data usage. My main issue is that I have a micro-sim lycamobile,when I asked for a repalcement to a nano-sim iphone and most of the new mobile they said no. sim off and I had to wait 14 days to receive via mail and active (8 calls) the new sim. If I goto swisscom/sunrise/orange they change for free mostly and you get the sim in the store. ADVANTAGE.. I thought it might have been a Swisscom issue but after it wasnt fixed within a day I started to suspect Lyca. If swisscom cant get something like this under control, then I wonder how they are so popular/expensive? Whatever it was it wasn't a local congestion issue. I had problems in the office in Geneva and at home 30k away.. And you guys have issues far away.. This is first issue I've had with Lyca, and for the price I can live with it. I make about 5 calls per month, everything else is data and nobody comes close to the proce of 10gb of data. So look out! don't think that those offers are by default. sorry to tell you your old provider wont let u leave until the 7th. i know its only 4 days but sheesh.. also some idiots at lyca mobile called me like 8 times in 3 days trying to get me to stay. i just tell them where i moved to NO SIGNAL..
2) CANT SET CALL FORWARDING ahhhh.... so even i want to leave early and call forward. nope that feature is dead. anyone know how the whole "can only buy bundles from non bonus top up" work? My Lyca only shows me the total amount of credit I have. (topup+bonus) Any way to see how much of that I have available to buy a bundle? money you have on your account. This drove me nuts. SO I left. of the rates and using them well is not well documented.